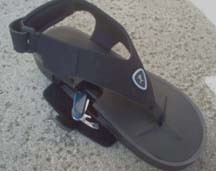 The ArchPort Sandals | OhGizmo! By David Ponce on 07/10/06 • Leave a comment! Each holds a fitted wallet-esque insert, while leaving enough room to accommodate keys or other small items. For safety, the cavities are secured with snap locks, plus Velcro covers that seal out sand, debris, and the ashes of murdered lifeguards. They’ll set you back a moderate $45.